Corporate management today is exposed to an area of conflict that allows only limited latitude. On the one hand, top management is regularly faced with the company owners’ requests for an appropriate return on equity or Shareholder Value, a request that executives of public companies are mostly obliged to by contract: “Corporate Mission Statements proclaiming the responsibility of management is to maximize shareholder’s total return via dividends and increases in the market price of the company’s shares around.” Hence a consequent orientation towards the financial interest of the firm’s owners, respectively its institutional investors is demanded. On the other hand, however, increasingly mature and well informed customers demand more and more customized goods for their individual requirements and are often known to change their buying behavior quickly. This behavior forces many organizations to an uncompromising orientation towards Customer Value, and a strict customer focus in both corporate planning and management, in order to further develop competitive advantages and to satisfy and retain valuable customers. This is particularly true for middle and lower management. Hence value creation for customers finds itself opposed to value creation for shareholders, which mostly leads to a persistent underinvestment of marketing functions, as marketing will not be able to assert itself in the internal battle for financial resources by only referring to intangible assets, such as brand awareness. This conflict appears to find its resolution only in a consequent consideration of customer relationships as investment objects, whose continuation or intensification must be justified through an evaluation of economic efficiency. The postulation for identifying valuable customers and investing financial resources in them while divesting those creating loss thus complies with the demand of value-based management, according to which corporate funds should only be granted for areas that create substantial value. Against this background, systematic customer valuations become indispensable in order to obtail segmented and efficient market development and to enable a supplier to substantially ensure the availability of the critical resource customers. Such efforts would then result in a value-oriented comprehension of relationship marketing and an intelligent management of customers, which consequently might even lead to the termination of a business relationship, should it hold a negative value. Contrary to such an approach would be the pursuit of zero-defections, intending to utterly maintain all customer relationships. Source: In dependence on: Cornelsen (2000), p. 2. The following chapter explicates the procedure by which this study acquires these objectives. The present study consists of five chapters. Chapter 1 covers the problem definition, the study objectives and the study procedure. The problem definition outlines the area of conflict between customer-focussed market cultivation on the one hand and organizational compliance with the financial interests of shareholders and institutional investors on the other hand, that arises if firms need to pursue both objectives simultaneously. Out of this problem definition the study objectives are formulated, followed by the study procedure where the author provides an overview of his approach to acquire these study objectives. Chapter 2 firstly contains the theoretical foundation of the study in terms of the coherence of Customer Equity and value-based management. The author hereunto outlines the fundamentals of the Shareholder Value concept and its associated value-based management approach, followed by the hence arising implications for the function of marketing. Furthermore, an appropriate reference base that integrates the perception of both value-based management and value-based marketing is described. The idea of Customer Equity as a management figure to quantify such value-based marketing efforts is explicated subsequently. Secondly, chapter 2 covers a further specification of the notion Customer Equity, whereby a distinction is made between its customer- and supplier-sided aspects. The author hereunto discusses respective definitions and explicates their interconnection with the previously characterized Shareholder Value concept. The chapter ends with an interim conclusion that summarizes the hitherto existing key findings. In order to provide a qualified valuation of customer relationships, their various value potentials need to be identified and examined. This is covered in chapter 3 which comprises a characterization of a significant choice of both monetary and non-monetary value potentials and their respective drivers. A further interim conclusion consolidates the essentials of this chapter again and leads over to chapter 4, which deals with the question by which methodologies such value potentials can be captured and eventually be measured. The author therefore explicates an array of chosen Customer Equity models, whereby segmentation into appropriate model types is undertaken, such as unidimensional, multidimensional, monetary, non-monetary and process-oriented. The author analyzes each model’s composition and provides a critical appreciation at the end of each respective subchapter. Chapter 5 eventually contains the author’s conclusion and a prospectus on related aspects. Entrepreneurial actions aim at the accomplishment of self-defined corporate goals, which are regularly the result of an extensive goal setting process. Although these corporate goals may vary because business owners will each make their individual contributions to such a process, a general orientation towards the firm’s shareholders’ interests has found its way into management theory and practice under the term Shareholder Value. The fundamental proposition of Shareholder Value is straightforward: stock owners (shareholders) consider an enterprise an investment object; hence their primary interest is an increase of enterprise value and, as a result, a profitable, yet at least a risk adequate yield on their investment. This approach has gained its significance since the late 1980’s through the increased number of enterprise acquisitions and their related incremental influence of institutional investors on management. As a consequence of this influence, managers today are increasingly forced to make entrepreneurial decisions from the perspective of an investor themselves. Last but not least, a continued increase in enterprise value is considered the most effective protection against takeovers today. That’s why Shareholder Value demands a measurement of every strategic management decision against its contribution to an increase of shareholder wealth, respectively enterprise value. The Shareholder Value approach is also termed value-management or management-value-concept. In dependence on this terminology the name value-based management shall be used synonymic for such an alignment of enterprises in the following. In order to measure the success of a value-based management strategy, traditional accounting measurement categories appear inapplicable, as they express past events, exclude risk aspects and neglect the present value of money. Hence the reason why the “net present value of all future cash flows expected to accrue to the firm” has become the basic principle for enterprise valuation, which is eventually reflected by the Discounted Cash Flow (DCF) valuation technique. This technique takes a future-oriented stance and incorporates both uncertainties and cost of capital. Enterprise value is thus calculated through the discounting of the future cash flows expected within a defined forecast period with the cost of capital rate, and the consideration of a possible terminal value. Following this method, the enterprise value consists of the capitalized earnings value, the terminal value and the non-operating capital. Subtraction of the firm’s debt from this enterprise value produces the firm’s Shareholder Value. This calculation method is commonly considered the most impartial operation to compare strategic investment options. The factors that influence enterprise value, respectively its underlying cash flows, are termed value drivers which are each analyzed separately in order to determine a specific corporate strategy’s effect on enterprise value maximization. The Shareholder Value Network, pictured in figure 2, represents one of the most popular value driver analyses and shows from a financial perspective which factors and set screws influence this overall corporate goal. Source: In dependence on: Smidt, Marzian (2001), p. 102. Value-based management has consistently been exposed to criticism due to its alleged exclusive focus on shareholder profits at the disadvantage of other stakeholders. However, value-based management has in the meanwhile been largely acknowledged, at the latest from the emergence of the New Economy, and is a permanently applied controlling concept in modern business management today. The main task of value-based management to work out strategies to identify and strengthen valuable business fields that contribute to enterprise value has also taken influence on marketing science. Cornelsen states that with regards to limited budgets, marketing and sales instruments should be assigned more intensely to the efficient constitution and maintenance of customer relationships rather than unilaterally to an at any cost effective marketing. Acknowledging the fact that different customers make more or less valuable contributions to economic success, this approach identifies customers as original corporate value drivers that require professional management if enterprise value shall be maximized. In fact, some authors consider customer relationships a firm’s most valuable asset and equate the sum of all customer relationships with the enterprise value. This view qualifies customer relationships investment objects that need to be treated like any other corporate asset. One of the most essential characteristics of such a value-based view on marketing is that marketing disbursements are no longer considered expenditure to be depreciated in the period of their accruement but genuine investments in corporate assets that create value over time. Regarding the fundamentals of value-based management, this perspective implies an assessment of all marketing activities in terms of their effect on the above contemplated value drivers that contribute to enterprise value. So if the corporate function of marketing shall contribute to value creation, all marketing activities should consequently be revised whether they contribute to the creation or augmentation of valuable assets. According to Wangenheim the ratio between the fair value and the book value of American fortune-500 companies lies at 3.5, indicating that more than 70% of these companies’ fair value is rooted in intangible assets which cannot be reported in the balance sheet. This ratio shows furthermore that such intangible assets are in fact valuated by investors although they cannot be balanced by financial accounting. In this context and with regards to the area of marketing, Srivastava/Shervani/Fahey introduce the term market-based assets and show their relationship with Shareholder Value (see figure 3). Source: In dependence on: Srivastava, Shervani, Fahey (1998), p. 8. Another source characterizes marketing-knowledge, brands, customer loyalty and strategic alliances as market-based assets. It becomes clear that these types of assets cannot easily be valuated against their contribution to enterprise value due to their intangibility. A fact which also applies to traditional criteria to evaluate marketing campaigns and –strategies: market share or sales figures can easily be manipulated through price changes; thus they lose their significance regarding measurement of an increase in enterprise value. Variables like customer satisfaction or customer loyalty are equally afflicted to issues, as they can only be associated to enterprise level indirectly or by plausibility assumptions. So what consequently remains is the request for criteria that allow measurement of both marketing success and the impact on enterprise value. This challenge of providing adequate measurement criteria is considered to be attended by the concept of Customer Equity Management, a marketing system that has committed itself to this requested value-orientation. The fundamental proposition of this approach says that, from a marketing perspective, the ability to acquire and retain customers is probably the most important asset to a firm because “in a rapidly changing technological environment, products come and go, but customers remain”. So according to Customer Equity Management “the secret to success is maintaining a profitable relationship with the customer, regardless of what products are involved, or how the products needed may change over time”. Following this view, the value of a customer relationship – its Customer Equity – results from a quality analysis of current and future customers and represents a value-based management variable for the nature and scope of the investments made in each of these relationships. So regarding Day/Montgomery’s question above, the valuated sum of all current and future customer relationships would then represent the contribution of marketing to enterprise value. Hence the objective of Customer Equity Management is a consequent consumption and enhancement of the firm’s customer base’s value. The principal concept of marketing is the voluntary exchange between contractually capable market participants, whereby customers will, from their own value-based perspective, most likely decide to spend their money for products and services that deliver them the highest benefit. Purchase decisions are hence characterized by individual buyer assessments, whereby Customer Value can be defined as the customer’s perceived net value represented by the tradeoff between the product’s benefits and the expenses for the customer. Figure 4 illustrates this concept in greater detail showing that Customer Value consists of a mix of perceived monetary and non-monetary value components. Hence a positive Customer Value unfolds with the sum of benefits exceeding the sum of expenses; a negative Customer Value is to occur under inverted conditions. However, Plinke points out that such a tradeoff-related balance represents only a necessary condition to a purchase decision. Only if no other supplier with a more favorable cost-benefit-ratio can be found (sufficient condition), a customer will ultimately decide to buy. Hence it is recommended that a value-based management of customer relationships should part from the widely spread egocentric supplier’s view on customer relationships and rather create win-win situations where both parties, supplier and customer, are able to profit from their business relationship. The herewith implied question on how the results of such efforts should be quantified is addressed by the concept of Customer Equity. Source: In dependence on: Kotler, Bliemel (2001), p. 8. Similar to customers trying to optimize their benefit through a specific buying behavior, value-driven firms aim to optimize their benefit through a focus on profitable customers who promise an adequate monetary backflow. Customer Equity could thus generally be defined as the economic value a supplier attributes to a customer. Cornelsen broadens this definition by the corporate goals a supplier might underlie as a reference base. He adverts to the fact that suppliers might temporarily pursue either monetary or non-monetary objectives such as turnover on the one hand and customer satisfaction on the other hand. Hence the supplier-sided valuated contribution of a customer to the achievement of the firm’s monetary and non-monetary objectives is suggested as a more substantiated definition for Customer Equity. Two central variables need to be distinguished here with regards to the degree of aggregation of Customer Equity: Customer Equity and the Aggregated Customer Equity. Consequently, a differentiation needs to be made between valuations of the entire customer base, of specific customer segments, or of individual customer relationships. Wille, Barth/Wille and Blattberg/Deighton suggest determining individual Customer Equities and summing them up to one Aggregated Customer Equity. Individual Customer Equity analyses are thus considered the basis for the determination of the contribution to enterprise value. In addition to the degree of aggregation, the number and type of considered value components can also be adducted to systematize Customer Equity: A differentiation is thereby made between quantitative (monetary) and qualitative (non-monetary) value components. Turnover and customer profit margin represent popular quantitative components on the one hand; on the other hand a multitude of qualitative CE determinants such as the information value, the reference value and many others are discussed in literature, of which some will be discussed in greater detail further below in this study. Customer Equity can furthermore be systematized by the dimensionality to analyze these quantitative and qualitative value components. Unidimensional approaches are based on one single criterion such as customer profitability or customer satisfaction, whereas multidimensional approaches incorporate multiple monetary and non-monetary criteria and combine them with each other. A further systematization can be carried out by a temporal dimension. Static, periodic approaches considering only a timely limited extract of the customer relationship (e. g. one business year) can be distinguished from dynamic, inter-periodic ones that incorporate not only past but also future performance figures and time horizons. According to Schemuth, Customer Equity can additionally arise from both an extroversive sales perspective, considering e. g. only turnover, and from an introversive cost-performance perspective incorporating also cost effects such as cost reductions. The latter is also supported by Cornelsen who distinguishes between a turnover-related and profit-related Customer Equity. Table 1 provides an overview of the above described differentiation criteria. Source: In dependence on: Helm, Günter (2001), p. 9. To sum up the hitherto examination, the conducted characterization of the fundamentals of value-based management has shown an overall implication to align all corporate functions towards the increase of enterprise value, expressed by a monetary top key figure. Funding of corporate functions and business areas needs to be assessed against their contribution to this value increase, thus requiring application of appropriate methodologies to evaluate economic efficiency. A transfer of these principals to the function of marketing requires a common reference base for both the customer- and the shareholder perspective. This reference base is constituted by the concept of market-based assets, which identifies customer relationships as a source of cash flows and hence as genuine investment objects. Scale and permanence of these cash flows are determined by the extent to which a supplier is able to create substantial Customer Value leading to favorable customer affinities and buying behavior. Customer Equity then produces the result of the firm’s valuation of these behavioral events and transactions according to different timely and factual measurement criteria with individual customers, customer segments or the entire customer base. So with regards to the first study objective as given in the introduction chapter, the coherence between Customer Equity and Shareholder Value is that Customer Equity brings out a measure of value for the contribution of marketing to enterprise value, related to a common market-based reference object. It quantifies a customer relationship’s value potential, by which an organization is able to make informed decisions on the efficient allocation of marketing and sales budgets. The Customer Equity concept is thus able to operationalize the Shareholder Value approach. 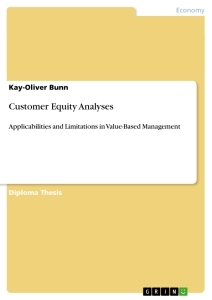 The following chapter addresses the issue of what different value potentials can be identified in customer relationships in order to determine Customer Equity. Monetary value potentials are consistently attributed a dominant role in Customer Equity. After all it is the monetary contribution of a customer relationship that is considered to add to enterprise value. For this reason Wille even proposes to neglect any other non-monetary Customer Equity value potential at all, as the operational focus of firms was mainly characterized by economical targets. Two chosen monetary value potentials shall be discussed exemplarily in the following: the earning potential and the cross-selling potential. The earning potential is a customer’s current monetary contribution to a firm’s economic success and represents one of the most significant determinants of Customer Equity. Turnover resulting from the realized sales volume and the obtained price with a customer also represents the central monetary positive value driver of Customer Equity. Earnings that accrue from the sale of core products or services at list prices are termed base revenues. Additional earnings are generated through various surcharges, e. g. for special packing or transportation services, and hold an additional positive effect. Base earnings and surcharges add up to the gross-revenues. Moreover, reductions in earnings have to be considered. Those include sales deductions granted prior or subsequently to invoicing, such as volume- or functional discounts on the one hand and allowances, bonuses or credit notes on the other hand. Subtraction of the reductions in earnings from the gross-revenues produces the net-yields, which represent the relevant valuation figure. As turnover alone does not provide information about a customer relationship’s profitability, it is commonly acknowledged an insufficient valuation figure. That’s why the customer contribution margin represents a more appropriate figure to describe a customer’s earning potential, as it incorporates the costs involved. Cost drivers are for instance the number of orders, sales attendances, trainings, sales promotions, order processing, mode of dispatch, order-related manufacturing overheads, and customer complaints. When these costs are compared to the realized turnovers, customer contribution margin indicates a customer’s profitability throughout a business period in monetary units. However, as most firms have product-focused information and management systems, this comparison is often afflicted to imputation issues. While the earning potential describes the revenues and costs a customer generates with a specific product or service, the cross-selling potential characterizes the additional earning potential that may accrue from the sale of other products and services. Cross-selling thus does not emphasize the sale of substitute or complement goods, but of different ones that are independent from the respective base product. Hence cross-selling can, from a relationship perspective, be compared to lateral diversifications where partners develop new business fields together and enhance their relationship creatively. A customer’s cross-selling potential is determined twofold: first by the customer’s demand still to be satisfied and second by his cross-buying willingness. With the former, two scenarios need to be distinguished: on the one hand a supply-specific demand gap, which can immediately be served by the supplier, and on the other hand a phase-specific competitive situation, where customers can still buy at another supplier who then first needs to be displaced. The latter describes a customer’s basic willingness to buy various products at a supplier. This basic willingness is significant, as customers with a high cross-selling potential might as well be unattractive to a supplier, if there is indeed demand, but no noticeable interest to invest in a business relationship. The cross-buying willingness is influenced by various factors, such as the individual preference for variety-seeking and diversification as well as the degree of satisfaction with past transactions. There is broad consensus about the need to optimize the consumption of customers through cross-selling. The reasons are threefold: first, the expansion of the sales volume to additional offers will result in a positive turnover effect and thus in a higher earning potential. Second, a positive price effect can eventuate, as customers that are bound through cross-selling are said to be less price sensitive. Third, cross-selling may lead to positive cost effects, as an enhanced production and sales amount leads to a better distribution of the fixed costs (economies of scale). There are also economies of scope to be expected, as production and transaction of cross-selling products are accomplished by the same factual and personal capacities resulting in synergies e. g. with the sales department. Source: In dependence on: Rudolf-Sipötz, Tomczak (2001), p. 24. As shown in the previous contemplations, Customer Equity is mainly interpreted economically. However, it is widely acknowledged today that Customer Equity does not only comprise monetary components that effectuate economic success directly, but also specific customer activities and behaviors that contribute indirectly. These contributions are called non-monetary value potentials and include essentials like the information potential or the reference potential. Other value potentials, such as the loyalty potential, the cooperation potential or the synergy potential represent enhancements of these essential value potentials. They are not covered in this study, as this would go beyond the scope of this study. Tomczak/Rudolf-Sipötz identify three determining factors of the information potential: quality and content of the provided information and the customer’s feedback behavior. A decisive and defining criterion thereby is a flow of information from the customer to the supplier. The sources to generate information are as well manifold and reach from institutionalized customer interviews, including marketing information systems, to customer workshops, feedback from pre-sales situations, and an active customer complaint management. No matter what information sources are eventually used, the value of customer information is dependent on its utility when applied with the supplier. A positive effect is thus only given, if the supplier is able to realize cost savings or increased earnings through more effective and efficient value creation and/or transaction processes derived from the provided information. Cp. Bischoff (1994), p. 4 et seq. Cp. Wille (2005), p. 1. Cp. Meffert (1999), p. 16 et seq. Cp. Eberling (2002), p. 1. Cp. Srivastava, Shervani, Fahey (1998), p. 2 et seq. Cp. Plinke (1989), p. 306. Cp. Wangenheim, (2003), p. 12. Cp. Höfner, Pohl (1994), p. 8. Cp. Cornelsen (2000), p. 1 et seq. Cp. Diller (1992), p. 583. Cp. Barth, Wille (2000), p. 15. Cp. Cornelsen (2001), p. 158. Cp. Cornelsen (2001), p. 157. Cp. Cornelsen (2000), p. 2 et seq. Cp. Barth, Wille (2000), p. 4 et seq. Cp. Wille (2005), p. 4. Day, Montgomery (1999), p. 4. Cp. Bühner (1990), p. 56. Cp. Wangenheim (2003), p. 10. Cp. Rappaport (1994), p. 53. Cp. Rappaport (1986), p. 3. Cp. Peschke (2000), p. 98 et seq. Cp. Bühner (1990), p. 1 et seq. Cp. Copeland, Koller, Murrin (2000), p. 3. Cp. Bühner (1990), p. 6. Cp. Rappaport (1994), p. 20. Cp. Wangenheim (2003), p. 11. Cp. Stahl, Matzler, Hinterhuber (2001), p. 357 et seq. The terminal value represents the estimated cash flows generated after the forecast period. Cp. Eberling (2002), p. 46. Cp. Rappaport (1994), p. 53 et seq. Cp. Copeland, Koller, Murrin (2000), p. 35. Cp. Henseler, Hoffmann (2003), p. 119. Cp. Henseler, Hoffmann (2003), p. 120. Cp. Kunz (1998), p. 392 et seq. Cp. Coenenberg, Salfeld (2007), p. 11. Cp. Pape (1999), p. 125 et seq. Cp. Eberhard (1998), p. 82. The Stakeholder Value-approach propagates an alignment towards all stakeholders’ interest. As a matter of fact, Stakeholder- and Shareholder Value-approach are circularly connected, as a sound performance requires satisfaction of all relevant stakeholders. Cp. Coenenberg, Salfeld (2007), p. 3. Cp. Cornelsen (2000), p. 2. Cp. Bellinger, Vahl (1984), p. 18. Cp. Wayland, Cole (1997), p. 4, Blattberg, Deighton (1993), p. 98. Cp. Wayland, Cole (1997), p. 4 et seq. Cp. Plinke (1989), p. 302. Cp. Wangenheim (2003), p. 12 et seq. Cp. Wangenheim (2003), p. 13. Cp. Rappaport (1986), p. 10. Cp. Srivastava, Shervani, Fahey (1998), p. 8. Cp. Doyle (2000), p. 302. Market-based assets can also comprise supply chain partners, such as strategic supplier relationships. Cp. Doyle (2000), p. 300. Cp. Krafft (2007), p. 86. Cp. Blattberg, Getz, Thomas (2001), p. 3. Rust, Zeithaml, Lemon (2000), p. 6. Rust, Zeithaml, Lemon (2000), ibid. Cp. Bayón, Gutsche, Bauer (2002), p. 214. Cp. Blattberg, Getz, Thomas (2001), p. 1 et seq. Cp. Kotler, Bliemel (2001), p. 5. Cp. Böhrs (2004), p. 35. Cp. Eggert (2006), p. 51. Cp. Kotler, Bliemel (2001), p. 57 et seq. Cp. Cornelsen (2000), p. 34 et seq. Cp. Kotler, Bliemel (2001), p. 51 et seq. Cp. Plinke (1989), p. 311. Cp. Barth, Wille (2000), p. 6. Cp. Panzer (2003), p. 15. Cp. Belz, Bieger (2006), p. 27. Cp. Eggert (2006), p. 48. Cp. Barth, Wille (2000), p. 6 et seq. Cp. Tewes (2003), p. 3. Cp. Krafft, Albers (1999), p. 1. Cp. Cornelsen (2000), p. 38. Cp. Schemuth (1996), p. 19, Cornelsen (2000), p. 38, Gelbrich (2001), p. 5. Cp. Wangenheim (2003), p. 15. The notions Customer Equity and Aggregated Customer Equity are chosen in accordance to the German terminology Kundenwert and Kundenbestandswert. Cp. Helm, Günter (2001), p. 7. Cp. Wille (2005), p. 38, Barth, Wille (2000), p. 4, Blattberg, Deighton (1996), p. 138. Cp. Henseler, Hoffmann (2003), p. 23. Cp. Cornelsen (2000), p. 39. Cp. Helm, Günter (2001), p. 8. Cp. Schemuth (1996), p. 24. Cp. Cornelsen (2000), p. 233 et seq. Cp. Rieker (1995), p. 50. Cp. Henseler, Hoffmann (2003), p. 17. Cp. Wille (2005), p. 42. Cp. Plinke (1997), p. 126. Cp. Tewes (2003), p. 80. Cp. Eberling (2002), p. 132. Cp. Krüger (1997), p. 114 et seq. Cp. Tewes (2003), p. 81. Cp. Schmidt (1997), p. 61. Cp. Rieker (1995), p. 50 et seq., Rudolf-Sipötz (2001), p. 69 et seq. Cp. Tomczak, Rudolf-Sipötz (2001), p. 132. Cp. Rudolf-Sipötz (2001), p. 96. Cp. Rudolf-Sipötz (2001), p. 100 who suggests the term cross-buying to emphasize the customer-sided perspective in add-on business. As this study takes mainly a supplier-sided perspective, the term cross-selling is used synonymously here. Cp. Tewes (2003), p. 87. Cp. Cornelsen (2000), p. 174. Cp. Rudolf-Sipötz, Tomczak (2001), p. 24. Cp. Rudolf-Sipötz, Tomczak (2001), ibid. Cp. Tewes, (2003), p. 89. Cp. Meffert (2005), p. 851 et seq. Variety-seeking behavior is rooted in the increasing replaceability of brands and describes the customer’s desire for alternation, although he may be reasonably satisfied with the currently used products. Cp. Tomczak, Rudolf-Sipötz (2001), p. 134. Cp. Tewes (2003), p. 90 et seq. Cp. Tewes (2003), p. 91. Cp. Cornelsen (2001), p. 160, Plinke (1997), p. 126 et seq., Homburg, Schnurr (1998), p. 171. Cp. Tomczak, Rudolf-Sipötz (2001), p. 132 et seq. Cp. Henseler, Hoffmann (2003), p. 20. Cp. Rudolf-Sipötz (2001), p. 113. Cp. Rieker (1995), p. 59, Plinke (1989), p. 317. Cp. Rudolf-Sipötz (2001), p. 114. Cp. Tomczak, Rudolf-Sipötz (2001), p. 137. Cp. Tomczak, Rudolf-Sipötz (2001), p. 136. Cp. Tewes (2003), p. 97. Towards Customer Equity: should marketers shift focus from brand equity? Customer Lifetime Value. Was ist ein Kunde wert? Kundencontrolling im wertbasierten Management. Möglichkeiten und Grenzen für das Controlling langfristiger Kundenbeziehungen.